My sister has a wonderful tribute to her horse Eve. Do go over - but take a tissue, because it made me cry, and while I am not a barometer to trust on all things teary (I cry at ads, folks) you would have to be stonelike not to be twanged by the amazingly wonderful story of a love between a girl and her horse. I had a horse too. Only - I won't make you cry, I promise. My horse wasn't one I pined for and woke at daylight each morning to see if she was born. She has no lore apart from the fact that she was a pony and lived up to her name. Alluded to in BB's post was a breaking-in school. She makes it sound like a rite of passage for the love affair that was between her and Eve - and obviously different people get different versions of events. I am two years younger than BB (and 1 month and 5 days, she just wears it better) and have always been. I cannot recall whether it was a whinge from me ("she always gets to do great stuff") or a wonderful idea of my father's ("can we get a bulk deal? "), but I also got to be a student at that school. And, as a metaphor for equine/human love lives, her experience of the long shot with misty hills and melodious backdrops is one for the romantics. My experience? Well, did you read my poem in the last post? Yep, cue rock music, quick-cut montage and the agony and ecstasy of what many confuse with passion. 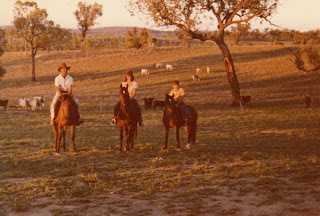 Dusty Gal was actually never my horse - she belonged to my uncle as my uncle owned her mother. Her mother was called Dusty because that is how she left her riders - and the apple did not fall far from the tree. She was given to me as my experiment because she was a squirt of a thing - like me - and as she would eventually have to be broken, I was the sucker small enough to attempt it. BB has a great shot of her coming adrift from Eve at this event due to the lack of full girth tightening. And by the way - despite her fears to the contrary, ALL of those teenage boys were definitely checking out the cute chick graciously arcing through the atmosphere. When people viewed my interaction with Dusty Gal, they had emotional responses also. Think - the youngest, cutest (what good is memory if you cannot enhance?) shortest person at the breaking-in school on the shortest horse most of the time. It was definitely a hoot worth taking your popcorn along to. The good news is, Dusty Gal never bucked. She had such an arsenal at her disposal in terms of removing riders from her back that she would not deign to such foolishness. She would bolt, prop, duck sideways, backwards and overboard. Other students of the school stood in wonderchortled in paroxysms of laughter at her lithe ability to not be beneath her rider, whether it be in the paddock where we took long rides (and I took long walks), in the big yard where we cantered figure eights (and I found the fence, the sand and my hat all too often) or even in the small yard where we were to "take the buck out" (ha ha ha - who needs to do that?). Oh, I did love Dusty Gal - I admired her grit (as I spat it from my teeth), her wit (untangling myself from wire rope) and her determination (as she repeated such offences with any grown man who tried to show me how I should be taking control). The best thing about Dusty Gal was that she was sneaky - an no-one was more relieved than I when she snuck into close enough proximity to the stallions paddock that she became a teenage pregnancy statistic and I was off the hook. And I realise that I also got to find many metaphors for Dusty Gal in my earlier love life. Too fast, too unreliable and dangerous - and I somehow believed I could break them. But then - I would always pick myself up, shake off the dust, swear a few times, scream a few more - and move on. (ha ha ha - that should give the googlers something to scratch their heads about). Now, I have spent so much time agonising over this post and writing it into my head, that of course it is now a whole bloddy series and then I dreamed last night that I had posted something trivial and relevant and ruined the whole 300th thing. Ever notice I obsess a bit? So what I am going to give you, as I put it together, over the next little bit is the career lowlights, and how a nice country girl became a corporate woman and then slid down the greasy pole of success to follow her dreams of poetry and pottering. Also, I will excuse the lack of the Reader's Digest photo at the moment - I haven't laid my hands on a copy to scan and I am awaiting Bush Babe finding her copy. To whet your appetite, a poem - not about being a career woman, but one I wrote during that phase of my life and one brought to mind by the post I read at Kill the Goat this morning. And the mating dance begins. Until all the pawns are removed. This is the proving ground. Attempt to save the King. With early morning rituals ahead. And so we bundle in bed. Talking. Holding out on dawn. Or I have often wanted from my lovers. We will at least enjoy the vicarious pleasure we bring. That we can regard each other honestly. To a DAMNED good time! Let BLISS mark the first. In the cupboard above the sink. When do I get one? That is right - another whinge folks. Sorry - I was up during the week at some point, but little things have popped my balloon. Here is a picture if you don't want to read on - I understand. We have been very good on the exercise every morning thing. Not going to this morning though, as we have softball and I need to meditate - after I write a few emails trying to sort some work things out. On Thursday night, my mum arrived and so 'Salina got a small half hour extra staying up. Friday morning we went on a walk and then 'Salina was "sick". She genuinely had a temperature (according to the very dodgy thermometer I have) and was very lethargic - and as she had been practicing hard for her performance all week and is the stellar student, I figured she must have been so let her chuck a sickie. She had an amazing recovery by 10, so I took her in to school and cursed. On Thursday, there was an overwhelming response to Pizza Day, and as I am the Tuck Shop Martyr, I was at school from 8 until 4 assisting. It was also the open day at school, so there was one half hour where I got to sit and appreciate my daughter's (and 21 of her classmates) work. I had to stamp down hard on my automatic responses (either genetic or learned behaviour - I love my father dearly, but he gave me more than brown eyes) of being critical of spelling, inattention to details, sloppy handwriting. There were some beautiful bits, but I had to try hard to notice them as I had been woken twice the night before - once in a phone call and once in someone slipping in to my bed - and my batteries were almost all out. I arrived home to find some emails about the work I had done during the week and high praise plus invoice matters and what more could I do. I responded with my very limited availability in the next little bit (I am actually fully booked most of the holidays) and I could help on urgent items only for a few hours only yesterday. I ended up nursing a child, working an hour, taking an unsick child to school, having an hour long phone call about that work, doing several hours work on it, sending a detailed email (another good half hour) about it, entertaining my mother, trying to extricate myself from a conversation with the neighbour, checking on responses to the email, saying good bye to my mother, sending the unsick child to her friend's down the road, checking on responses to the email, taking a new car for a drive to the shops with V, shopping, listening to V's assessment of the vehicle, checking on responses to the email, getting an unexpected visit from my father, hollering at my unsick child and her friend to get out of the drain, saying so long to my father, sending unsick child to the bath, checking on responses to the email, having a phone call about the work, explaining the work, sending through more information, having another phone call about the work, going to our reception venue for dinner and watching the footy with V. (Wasn't the Broncos - they are tonight). Please don't try and understand that last paragraph - I am still trying to catch up on what the heck it was all about. And that was only half of it because I edited. Anyway - am doing softball this morning, looking after cousins this evening, packing tomorrow, going west to my family and visiting for a week (where I will try and sort a few work things out), back for a weekend to spend quality time with my sweetheart, try to sort a few work things out, back to my family to collect my daughter and try to sort a few more work things out and back here for school and try to sort a few work things out. I will try to check in at some point over the next two weeks - but really, I just want to check out. Oh yes, very coy and cute in the afternoon - but don't believe him. You cannot sleep IN when Eddie wants OUT! How long does it take to teach a cat "not before sunrise" anyhow? Currently set for 5am. It is peak hour on the (barely perceptible) waves. Unfortunately there is nothing in the fine print about age being a barrier to falling OFF the bike. The worst bit about doing so, of course, is as an adult you know its going to happen for that 10 minute period between losing balance (so totally due to the sand at the side of the cement path) and hitting the cement when you to contemplate just how darned hard you are going to hit and how much hide you are going to lose. 'Salina was an adorable nurse, offering her wad of tissues as bandages and wanting to see gushing blood. Unfortunately it was the worst kind of knee scrape - the sort that offer no gushes of blood so you can't really impress either your child but still hurts like bujere*. I recovered and we did the whole beach to beach ride this morning, got a few grown up tasks done (mail and newspapers) and even had time for a coffee at the very smart cafe that was open at 6.30am. Th very smart cafe hurt more than the knee, though - a cup of coffee for me and a toasted tomato and cheese for 'Salina came in at $10 - OUCH!!! Guess what I am doing after I sign off here, sing 'Salina to sleep and say nigh-nigh to my long-distance sweetie? I am doing up the invitiations because finally the bit of Plan K we liked gelled with all other components and we have another box ticked. Less than 2 months to go! Its official - I am back to sole parenting Monday-Friday while my honey goes off to work at the salt mines up North for the next little while. It seems that the local industry is about 20% lower pay rate than the rest of the world and the organisational capabilities of some contracters would make great sitcoms. In other news - we didn't find another perfect site - so plan D is being formulated. I am exhausted - started my day at 4am when the "to do" list in my head started knocking on my consciousness, asking me to remember. After waving V off, 'Salina and I started our get fit campaign with a half-hour bike ride along the front. The wedding work means keeping the bones and rejigging the whole timing sequence. Email negotiations between Moscow (where the celebrant is touring) and here were far easier than discussions between the local council and here - but I am confident that Wednesday will see the fog lift and the invitation printing commencement. Two months to go today! The paid work is fantastic, and hopefully the doors are opening and I can convert blind optimism into confidence. The P&C work - okay, I am not so sleep-fogged that I can conjure a great deal of excitement for the job I just did for them, but we had a meeting tonight that actually had some forward movement hinted at there. The housework - well, I had a friend call me at lunchtime today and I was able to multitask so it was a pleasant and fruitful phonecall, and my floors are much more pleasant and less fruitful (and dustful and crumbful) so we can go back to eating off the floor! About to crash now - may not be around often this week with the few projects on the go, but will visit when I can. July - cold. Of course, for those folks who equate "cold" with digging snow, this would be about spring weather for you. As a result, the sun and morning warmth will get you out of bed well before 7am. Also as a result, all those Summer clothes that were snug last year (comfortable for about 5 years before that, loose 2 years before that and new two years prior to that) are telling you that you have TWO options. ONE - buy a whole new wardrobe!!! I am thinking seriously about option TWO - besides the obvious budget creativity that would be necessitated by option ONE, there is also the factor that while I could bury my head in the sand about my widening girth (or rather, into a mountain of food) and reswathe the load, I would feel a bit more confident about myself if I like what I show - rather than hate what I hide. With these cathartic thoughts rolling around my brain, I was an enthusiastic endorser of the family proposal that we cycle early to check out sites, have a light picnic when we had found the next perfect spot to be wed, check to see if we had won lotto and come home refreshed. there were no "perfect spots" except the original "perfect spot" darn it - so disappointed that some other bride found my secret location and was organised enough to book it before me. The GOOD news is we are really good at working through such little misfires, it is still a beautiful day, I have refuelled, caffinated and rehydrated, the garden got the brunt of my forceful pre-menstrual personality and there is steamed spinach galore for the freezer, the only cake I made and iced was banana (and I hate banana) and we are going for a swim and a checkout of the nearly good enough spot to see if I can come to terms with it. I have to abjectly apologise to Alison and Megan for wrecking their meme so freshly started. I have to admit - I was scared and so I buried my head in the sand. Megan created a Never Ending Protection of Children meme only a few short weeks ago. This is a meme virus with a twist - a never ending story, just like the never ending need to keep kids safe. Add a single sentence to the story so far (cut and paste the story to your blog and then add your child protection words of wisdom). Anything goes as long as it is a story that can be read by kids and it focuses on child safety. Don’t think too much, just write a sentance that follows on from the story so far. The sentence added must be child protection friendly. Nominate ONE bloggy friend to continue the story. At the bottom of your post, link to the person who wrote the last sentence. Link to these rules too so that your bloggy friend knows what to do (send me a track back so I can keep an eye on the story…and if you’ve got no one to tag, tag me…it’s a game and I love to play). Send a track back to your bloggy friend or let them they that they’ve been tagged with Never Ending Protection of Children meme. There’s no cure for the Protection of Children virus. I hope you catch it because it is only together that we can keep kids safe. I knee knocked in front of the local child welfare office, my dry mouth wanted to scream obscenities at me and tell me to mind my business. The small child in my arms was doing enough screaming for both of us, arching his back, kicking his legs and waving his arms about furiously. Well - I am scared. Scared as I always somehow break rules or say the wrong thing and so I did what I tend to do in situations like that - I buried my head in the sand. But this week is Child Protection Week and I got some information home from school that may help me. Therefore I now have a leaflet that gives me all sorts of ideas of what may fit into the "child protection friendly" box. Before, I must admit, I played it a lot by ear, because although I know others who had childhoods where protection would have been a dandy thing, my childhood was very innocent and isolated. I know I should be more educated in the correct procedures on child safety and have actually attended one seminar regarding it, but I could not see ways of weaving my very practical spin on things, my fanciful writing style and the story where it is currently abodes into a "correct" anything. I am sorry. "No" shouted the girl "Stop it. I don't like it." Yay me - I have made an effort in updating my blogroll (over to the right and down a bit). If you are a voracious reader of me and I have inadvertently left you off or spelt you wrong, please let me know. Of course, I must admit that the huge list you see there is unfortunately a fraction of those who I find on procrastinatory ambles around the blogosphere and as a result, I have an atrocious amount of blogs in my reader - I do have it categorised and I do tend to skim a fair bit, but sometimes something catches my eye. Empowering Girls: So Sioux Me - Steal This Christmas Gift Please! - for all mothers of girls thinking "what to get"
Again from You'll Eat it and Like It! - Pollo al Chilindron - hmm, notice a theme here? I ain't gaining weight from just looking at recipes - thank goodness, because otherwise this blog would be named "Paradise in Jeanie" wouldn't it? Three Ring Circus - Approved - yay. 'Salina starts softball this weekend. Now, I know there are several camps of people in the world. There are those who will go "cool" and there are those who will shrug and think "so what". The big so what about it, actually, is that this is the first moment in my child's life where I get to vicariously live my glory days - I don't have all that many to reenact and so I have to grasp an opportunity like this with both hands and sing to the rafters. I mean, I know I get to relive my youth when the teacher tells us of her chatterbox nature and vaguities - oh yes, transported straight back to my own childhood - but I get more a whistful whimsy about that rather than a fist-pumping "that's my girl" reaction. But softball? Ah, softball defined us as kids. I may have mentioned in the past that I went to a small school. It was a very small school. At the time there were two teachers and about 27 students. That equates to one cricket team and one softball team with a few reserves. Not many. That also equates to a guaranteed spot on the team from grade 2 onwards. That also equates to at least 5 years involvement in the best doggarned "B" school softball team in the whole region. And man, we were a crack team. Unbeaten except for once in the whole 5 years I played - and that was when they were seeing if we were good enough for the "A" school competition. The "B" schools competiton was made up of all the little schools (and in some cases, combinations of really, really little schools) in the regions and the next-best team from the "A" schools. "A" schools were those big enough to choose who got to play on their team through a selection process based on merit rather than having to take everyone to make up the numbers. Our challenge was to meet the winners of the "A" School Trophy to see if we were worthy of moving into the big time. That equates to our crack team of 7 - 12 year olds up against the best 12 year olds in the whole region. It wasn't pretty, but we didn't disgrace ourselves. The real unprettiness was learning how to be gracious losers - we didn't have a lot of practice at that - we had plenty of practice at being gracious winners, so we had to pretend it was exactly like that, and most of us pulled it off fairly well. Anyhow - back to our glory days, not our one day of shame. Being in a team such as ours, we had to learn as soon as possible what our strengths were so the team could use them, and to learn what our flaws were so the team could hide them. I am crap at throwing long distance - mainly due to the fact that I am really crap at seeing anything clearly (which I didn't realise at the time) and aim is an issue when you can't see the target - so while its great to hide someone in centre or right outfield who is crap at quick fielding, I was in the infield from pretty early on. I never wanted the cream jobs - I have never been one to say "pick me, pick me" for the plum roles, and so I found my niche at second base. Just quietly, second base is as glamourous as shortstop without the hurrah; as integral as first when first has let you down; and not at all "the one who hides behind the pitcher to be slugged if she ducks the straight drive" - you can catch those suckers with your leather shield! Despite my shocking eyesight, I also had a great deal of fun at bat. My sister was one of our two gun pitchers, and so to help her practice I got to spend a lot of time swinging and getting my eye in every afternoon. And if you were on our team, you swung. I didn't even know the concept of bunting until a former classmate made the big time in high school and came back to coach us. Actually, I still scoff at the concept of bunting. The "B" school competition was not about strategy or using the back foot - you swung and you cracked or struck out - there was no in between! In fact, the only strategy that I can recall ever used in the "B" school competition was used against us (and against me in particular) (because memory works like that - it focuses on the "me" bit) was to walk the slugger - and I was the slugger. My hitting zone therefore became anything that hadn't actually bounced before the plate or that I could reach in a stride - and I loved punishing that strategy!! As I said, gracious winners. My glory days ended when I entered high school and discovered those girls who got to play in the "A" competition had to deal with pitchers who had other strategies I hadn't even considered - who knew there was anything other than "the good ball" or "the walk ball". Therefore, we have been waiting patiently for an opportunity for 'Salina to join a team for a while now. She wasn't overly interested in the concept of T-ball (which I can understand) and we weren't interested enough in 8.30am Saturday morning fixtures in a sport she wasn't interested in to push her. So our efforts have been confined to the back yard (well, except when the ball is hit over the fence) and we have worked on her excellent arm and hitting skills. She is still an absolute wuss at catching, but getting there. But this weekend - its the big time. I get to bring out my inner softball mum and dust off the barracking voice. No, not the hum of the construction work being finalised next door. Not the whir of the washing machine doing its last load for the morning. Not the revving of engines as caravan-towing holiday-makers discover this great straight road. Not the screech of the saws of the installantion crew fixing the drainage. Not the chatter of the local radio station. Not the tapping of my fingers on the keyboard. Not even the songs and twitters of the native wildlife. Yes - that - the silence. It is here somewhere, I swear!!! I heard it just a little while ago - just after the school bus left and the smoko van had tooted its call to the workers. Yesterday morning, I went to the back door to discover an absolutely petrified frog clinging to it. Strange place for a frog, thought I, as we do have a cat and that would be about the perfect spot for him to taunt it - a bad habit that our cat has developed out of being a sadistic creature of his genetics. Grasshoppers, crickets, lizards and frogs' only hope once spied is if the humans of the house are on their saviour game. I then opened the door and discovered our "indoors at night" cat outdoors and very interested in being back indoors, mainly by virtue of the fact that that is where he had chased the frog last. But the frog was lucky. I had a plastic bucket close at hand, 'Salina had a sheet of paper and so we scooped and saved the frog to deposit in the back yard. Eddie is cute and a creature of hunting, but he is quite dim so couldn't work out what had happened to the frog. 'Salina and I were patting ourselves on our backs when we heard the distictive sounds of a frog screaming. Now, once you know this sound you can't mistake it. Eddie, 'Salina and I sprang to attention and ran to the back windows - to discover the frog we had saved in the beak of a kookaburra - who stopped the screaming with a few judicious taps on the branch. I almost got philosophical about the parallels of that frog's morning and life in general when I pulled myself up for being a melodramatic drama queen (yes, even I notice that tendency). I mean, the frog had had a crap day. Nothing to read into it. I don't know if you realise this, but I am what is euphamistically regarded as "comfortably covered". I am not fat as in the "oh my goodness, I need surgery" field - more in the mellower "gee, when I thought I was fat in my 20s I was really skinny compared to now" sort of fat. V is really good at wading through the me feeling fat minefield. I think that he has either read a secret manifesto on it OR he has had training (I don't know where from - I have met his ex and she is a "so skinny you can feel her vertebra" type of woman). Anyhow, If I ever pull out the "I am fat" moans he gives me the reassuring "if you are unhappy I will support you in every endeavour but I love you happy" spiel. Sweet. Then he makes going fishing moves and if it is a hormonal related fat frump I am in I can read that as him saying loudly and clearly that he feels I need more low fat alternatives in my diet (but then during hormonal related fat frumps I can get p!issed off at any move so noone can win) but if it is just a general fat frump I can understand the move and wish parts of me could go fishing with him - heck, especially the bits that would serve better as bait! Anyhow, how does this relate? Yesterday, we also had an unwitting playdate for 'Salina as a friend had a night out and was feeling "delicate" so rather than have her son entertain himself for a glorious Sunday we invited him over to ours. One of the main drawcards in coming to our place for him is the fact that I cook - and I let him help. (One of the main drawcards in having him come to our place is my innate martyrdom complex, no doubt. There are parts of my inner psyche I chose not to explore). As I said, finally we cycled back to their place to deposit said child and his container of cookies. My friend had her neighbour and son over for a beer. The neighbour is nice enough. However, if you were to do a spectrum of types of mothers, she would be right up at the other end from me - and she would no doubt say the same about me. But we are nice and civil and polite to each other there are so many things here that I have struck out so please just understand I have an overwheling judgemental "it seems we end up with the children we deserve" diatribe going through my mind like a soundtrack when we meet - not that she would notice because, of the things she notices, how her child behaves does not appear to be one of them chatting about life and how much was drunk last night and what men were pashed, the universe and whether texting was a positive or negative aspect on making hook ups and everything my goodness I was over that lifestyle in my 20s and I lived it pretty hard then but hello we are all over 35 now. She is very beautiful. Her son also inherited her looks. Anyhow (miaow), as I was leaving, my friend thanked me for the biscuits and said to her neighbour how I always came bearing food gifts and how great it was and how I was always cooking great stuff. "Yes" drawled the neighbour, looking me up and down "you can tell." Nice to see I wasn't the only b!tch with subversive thoughts on the veranda! Still working out whether the frog and I were somehow connected! I was putting together my "to do" list this morning, and suddenly it hit me - the date. This day ten years ago, I fell in love. The man I fell in love with fell in love with me also - it was a whole heap of falling and a plethora of love - my friends even complained of the quagmire of love that surrounded us, ten years ago. His accent was rich, his words so softly spoken, his thoughts and moods deep and profound. He played guitar for me and wooed. I wrote words for him and sang our love songs to the world. Now, as you may (or may not) know, the man I fell in love with all those years ago is not the man I am in love with today - not because he became a different man but because, really, it is a different man. Its funny, but for all the vivid painting of minor dramas in my life I tend to do here, there are bits that are merely allusions. P. was not my only ex - he just happened to be the one I came closest to sharing swathes of my life with. (Ah yes, it seems that there are more than 2 men who can find a fat generous woman attractive). I once counted up the boys and men with whom I have dallied emotional or other waters with - and yes, footwear did have to be removed. Unfortunate that it was a large number and it is every woman's dream that she find her perfect match the first time around. Fortunate it was a large number because I would SERIOUSLY question myself being attracted to a man that held all the romantic (and not so romantic) life lessons I had to learn in life. Some of them were great lessons in life and some of them were great big lessons in life. As is the sychronicity in life (and blogworld), a moment after I realised the date this morning, I read (through the click on a link on someones comments box random act) Mommy Needs 5 Minutes talking about the love she would never forget - oh joy, I never thought all the mistakes that I had made in my life when I was making them would end up to haunt me not only through lack of judgement at the time, but lack of preparation for my daughter! Just so long as she never falls for the veranda b!tches pretty boy son, I like to think I would be the sort of mum she could always rely on (as I do with mine). One story bubbling around the blogworld at the moment is the rally behind Tiff and her most beautiful daughter Ivy at My Three Ring Circus. Tiff is a most beautiful mother whose child Ivy suffers from words too long for me to remember - in laymen terms she is home until her system gets another inkling of danger, she gets screwed around by the "should she, shouldn't she" debate by health officials and when she finally gets admitted (a million miles from home) horribly sick and treated with huge white man medicine (and varying bedside manners) she improves enough to go home to enjoy a little more time with siblings before the cycle continues. Tiff has other children. She even has a child who suffered similarly in her infancy - who was treated with something called IVIG (don't quote me) and is now a pre-teen with attitude. Ivy has been denied this treatment. We don't have the definitive big doctor terms for this, but obviously there should be either a BLOODY GOOD REASON for Tiff and Ivy and the whole family to go through this crap or the right person look at this case and give the double thumbs up. Read the beginning at Someday We Will Sleep and consider signing the petition. Apparently over 600 have done so already. And apparently people who do have influence are taking notice. I don't know if any one individual signature can cause change, but enough notice and the right people might get advised of the noise out here in the blog world and take another look at Ivy's file and made a decision about her future treatment that makes life more enjoyable for her and her family - or at least give a really good reason why they should keep going through such crap. Still not in a good enough mood to make light of my life at the moment. The universe is normally quite kind to me, which is why I am quandrifying it all. Obviously a lesson to be learned here. We have no choice but to learn, really - life lessons have a habit of ensuring they are thorough. Of course, then you see that 200,000 are homeless and wondering where there next meal is in India due to flooding - and it all gets put into perspective. I mean - we have a bumper parsley crop to keep us from the dogs. And I do need to slim down a bit to move all those funky frocks from my performance days into contemplation for being wed (thus saving me from hard decisions involving either fashion or finance). That means all the cycling in my future can possibly be filed under "pronoia". Still working on the other issues. I am sure sometime soon I will be back blowing sunshine. Last week, I was a heroine and stood in for the convenor while she partied with her family at the other end of the state. One mother gave me a hand for an hour - and then it was me against the hordes - and the hordes were hungry. I gave thanks to my three grade 7 helpers with leftover fruit salad and some oven baked nuggets I would have had to turf as I miscounted (don't ask - things were frantic). Today I helped in tuckshop as usual and found out that one of my helpers (a rather overweight girl) had been banned from coming to tuckshop - because she had put on too much weight. I had to ring the vice principal to advise her the truth of the situation. The main reason I had given the girl this free fruit salad and nuggets for helping me last week was her lunch consisted of dry muffin mix! When asked about what "healthy" stuff she had, she said she had eaten an apple the previous day. Sorry - have not been around the traps (here or at yours) for a few days and may be for a few more. Its about chasing the almighty dollar and attempting to limit the tidal flow. Hopefully it will all be sweet again next week and I will see you (here and and at yours) then.